Greta Van Fleet have become the driving force behind rekindling the flame of a genre that some have considered snuffed out. 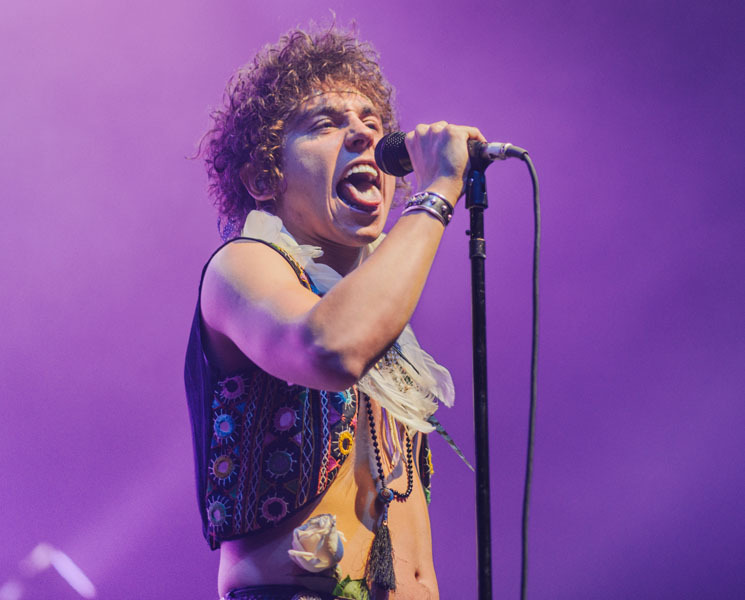 Not only are they proving Gene Simmons and many others wrong, but in a time when the mainstream airwaves are pouring with heavily Auto-Tuned artists and incoherent ramblings, Greta Van Fleet have answered the call for those who crave genuine, raw, adept musicianship. Their stop in Edmonton at the packed Shaw Conference Centre was a memorable and inspiring event. Running in from stage left, bandmates assumed their position and, with a quick intro, the guitar of Jake Kiszka twanged the familiar riff to the group's breakthrough song, "Highway Tune," followed shortly by the bellow of vocalist Josh Kiszka. Like a shot of adrenaline to the heart of the audience, the howl widened the eyes of audience members. The similarity behind the tone of Josh Kiszka's voice to Led Zeppelin vocalist Robert Plant is apparent, and has been referred to time and time again; however; what is most notable is Kiszka's unparalleled range, capability and control. "Edge of Darkness" included an impressively lengthy guitar solo from Jake Kiszka that included some time spent with his guitar over and behind his head. "Flower Power" was kicked off with a fistful of flower petals being thrown into the audience by Josh, and ended in a transcendent keyboard solo from the youngest of the three brothers, Sam Kiszka. The group's ten-song setlist had many prolonged variations on original tracks, including a the cover of Howlin' Wolf's "Evil." Each member had the opportunity to throw some weight around and highlight their individual capabilities. Before taking a brief leave from the stage, "When the Curtain Falls" played as a cliffhanger before the group's encore, which included fan favourite "Black Smoke Rising" and finished the evening with an exhilarating and masterful drum solo from Danny Wagner before wrapping up with "Safari Song." At such a young age, the members of Greta Van Fleet show an incredible amount of maturity and integrity in their live performance. The world needs more Greta Van Fleet, and less "mumble on the beat."